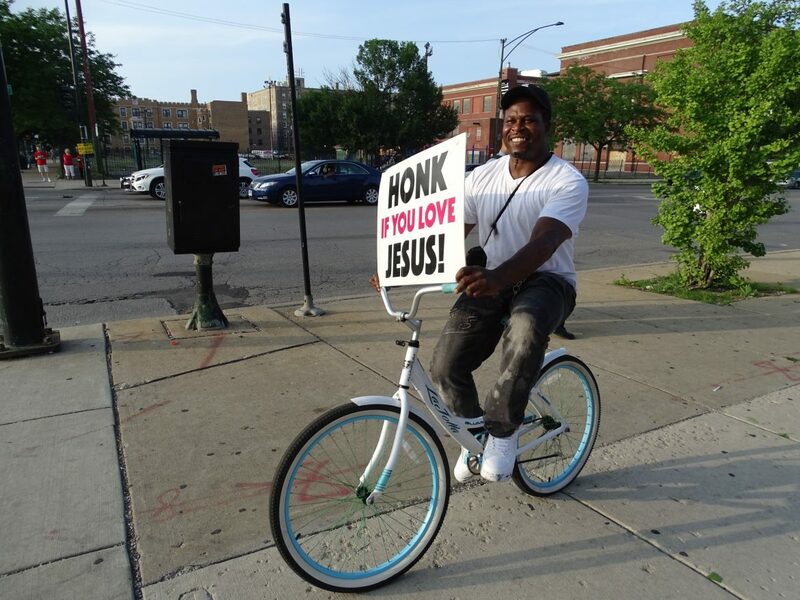 For the eighth summer, residents are taking to the streets on Wednesday nights as part of the 100 Blocks/100 Churches campaign. Members of the 15th District CAPS office, various Austin congregations and community groups have been taking part in the same “positive loitering” they have in the past, standing on several corners in an attempt to reduce crime. Complimentary food and music are provided at some locations during the Wednesday 100 Block / 100 Church events. Participants unify by wearing red and waving signs calling for an end violence. Complimentary food and entertainment are offered at some locations. Information regarding public work programs and professional development resources is also available. In years past, groups have remained stationed in various intersections throughout Austin. But this year, groups have begun walking through the streets to raise awareness with others not standing on the corners. The annual campaign was launched in 2010 by the 15th District CAPS office as a way for community members to get become active in the district’s mission to reduce violence in the community. Minister George Bady, founder and CEO of the Jehovah Jireh #1 outreach ministry, said he decided to get involved in the program about three years ago to prevent parents from feeling the losses he did when his oldest son was killed from gun violence in 2010. “I didn’t want any parent to go through the pain that I went through, so I got out there to give back,” Bady said. In his time coordinating locations for the campaign, Bady said he has seen many people use information from the events to find jobs and join churches. The campaign improves the narrative of the neighborhood internally as well as externally – and he hopes it can grow beyond Austin. “We don’t care what people say about the community or how bad they talk about it; we go on those blocks, and we show love,” Bady said. Robert Louis Stevenson, senior pastor of Rock of Our Salvation Evangelical Free Church at 118 N. Central Ave., said during his three years participating he continuously encounters people thanking him and other participants for keeping the neighborhood safe during their Wednesday gatherings. “I’ve heard so many people come up to me and say how different and how much safer these corners are when we’re out here,” Stevenson said. For more information, residents can visit the 15th District CAPS office at 5701 W. Madison or call (312) 743-1495. West side residents will meet at various corners in Austin at 6 p.m. tonight and every other Wednesday in June and July to take a stand against violence. More than 30,000 Austin residents are supported by Catholic Charities’ various services. The center, which has been open since December, is located at 5645 W. Corcoran Place. 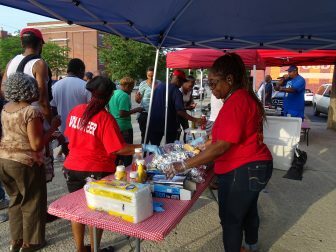 Residents in the 900 block came together - as have many other blocks across Austin this summer - to share food, fellowship and hope for the future.